A virtuous young man pledges his love and fidelity to the girl of his dreams with a precious stone…a diamond. And the happy girl treasures the gift as she would her life, promising, in return, her own fresh, virtuous love in marriage. the ring–with its precious gem–becomes a symbol of fidelity for the engaged couple…and a reminder of the priceless value of virtue in them both. 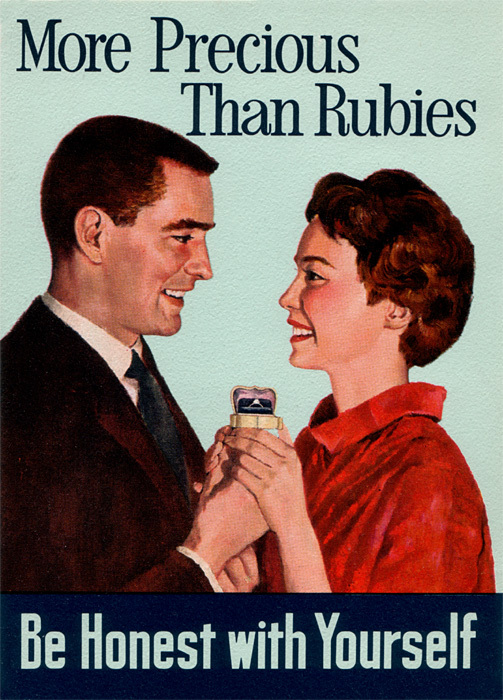 Solomon said it centuries ago: “A virtuous woman…her price is far above rubies…” For man it is equally true. Cherish–how beautiful and meaningful the word: to hold dear; to trust or keep with tenderness. And virtue: integrity of character; uprightness of conduct; chastity. Modern prophets have reaffirmed this eternal truth. So, young people of the Church, if you would deserve the confidence of the clean young man or young woman you someday hope to marry–if you would enjoy the fullness of happiness which belongs only to the pure in heart, be clean, be chaste.